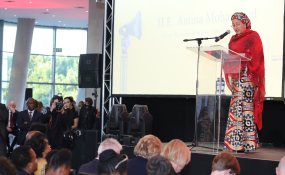 Deputy Secretary-General Amina Mohammed at the World Aids Day Reception in Johannesburg, South Africa on December 1, 2018. During her current trip to South Africa, Deputy-Secretary-General Amina Mohammed has spoken at several events in Johannesburg, on the importance of the 2030 Agenda for sustainable development - the UN's blueprint to end extreme poverty, fight injustice, and protect the planet, ensuring that no one is left behind. Ms. Mohammed's packed Sunday schedule began with a morning session, the Motsepe Foundation Breakfast, on the subject of Sustainable Development Goal 5, which aims to "achieve gender equality and empower all women and girls." The talk, she pointed out, took place during UN Women's 16 days of activism to end violence against women and girls. Explaining why a stand-alone Goal for gender equality is necessary, she said that "the issue of inequality is deeply rooted and engrained in all societies, and it prevents us from truly prospering, developing and creating a more peaceful world." In addition, The Deputy-Secretary-General said that femicide is a pandemic, with 6 women killed by an intimate partner of family member every hour. She also highlighted that only 5 per cent of countries have a female head of state, and that women always suffer disproportionately in times of conflict: "Not just sexual violence, but all forms of violence against women escalate, and pre-existing gender inequalities are exacerbated," she said. Sunday was also World AIDS Day, and Ms. Mohammed gave a keynote speech at a High-level event on Adolescent Girls and Young Women, with the Global Fund to end AIDS, TB and malaria, and the Government of South Africa: the Day was, she said, an opportunity to "reflect on the great progress that has been made, both here in South Africa and around the world but also to intensify our efforts towards ending this for good." Commending South Africa for taking decisive steps to end the epidemic, she said that the elimination of AIDS is one of the specific targets of Sustainable Development Goal 3, which aims to "ensure healthy lives and promote well-being for all at all ages." At two other events, Ms. Mohammed said that more needs to be done if the Sustainable Development Goals (SDGs) are to become a reality: at the Global Citizens Festival, she said that the 17 Goals are the roadmap to end poverty and take climate action, but "it is not enough, we need to more," and, at the SDG Advocates Reception, she called for more concrete actions, especially in funding, to "move the needle" in areas such as health, education, climate, and gender equality; for governments to be pressed to accelerate action; and for a people's movement to be mobilized now, to work towards achieving the 2030 Agenda. On Monday Ms. Mohammed spoke at a private sector breakfast on the SDGs, where she pointed out that the 2030 Agenda is of particular importance to Africa, given the social, economic and environmental challenges faced by the continent: "These range from climate change to poverty, from hunger to youth unemployment and illiteracy, from political instability and corruption to violence, terrorism and civil wars." Ms. Mohammed thanked those African business leaders who have already signed up to the Global Compact, the UN's flagship body for sustainable business, and invited companies who have not yet done so, to join the initiative: Global Compact Local Networks play an essential role in mobilizing business to fight corruption, contribute to national SDG Action Plans and policies, and support initiatives that promote peace and stability.